The building on the left in this photo is 55 Water Street in Lower Manhattan. Every year, since 1999, a pair of Peregrine Falcons have nested on an outside ledge on the 14 floor of this building! Many Peregrine Falcons have settled in large cities lured by the cliff-like topography of high rise buildings, and the plethora of available prey. They build nests on cathedrals, skyscraper window ledges, and the towers of suspension bridges. In Lower Manhattan 55 Water Street seems to be a favorite perennial location. The crow-sized falcon is admired for its incredible speeds, which are seldom exceeded by any other bird. Plunging from tremendous heights, the peregrine falcon can reach up to 180 mph in pursuit of prey. It feeds primarily on birds, which it takes on the wing. 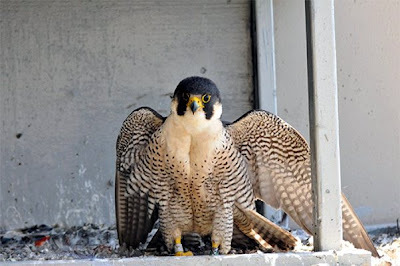 Peregrine Falcons were placed on both the Federal and State Endangered Species lists in the early 1970's. Their numbers were severely decimated by post WWII use of DDT pesticides, which was later found to alter the reproductive behavior of the falcons and cause eggshell thinning. The release of young captive bred birds, from 1974-1988, helped lead to their return as a nesting species. Peregrines first returned to nest on two bridges in New York City in 1983, and the population has grown steadily since that time. By 2003 there were close to 50 pairs present statewide, and New York City now has probably the largest urban population of peregrine falcons anywhere! The Department of Environmental Conservation, or DEP, monitors and assists the falcons by placing wooden nest boxes filled with gravel at many of the sites to increase productivity. If you look closely at the photo above you can see the falcon sitting in a nest box placed on the ledge of the 55 Water Street building. The DEP also bands young Peregrines to provide important information on the bird's movements, which is essential to understanding their habitat needs year-round. The nestlings are removed from the nest box, or natural nest site, for a short time and two colored metal bands are placed on the birds legs. These bands are uniquely lettered and numbered so that if the Falcons are observed later, or found injured or dead, they can be identified. When the birds are banded they are also checked for overall health and condition. 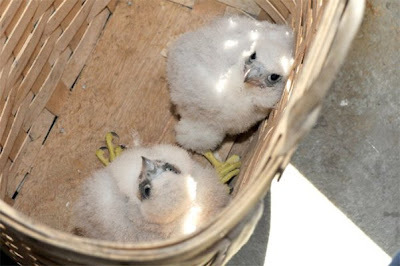 On May 20, 2009 wildlife biologist Chris Nadareski banded the 2 male and 2 female fledglings from the peregrine falcon nest site at 55 Water Street. This year the 2 male fledglings were named by the children of the Vigiano brothers, one of whom was a police officer and the other a fireman, who were both killed when they responded to the attack on World Trade Center on September 11, 2001. The first male fledgling was named was named “Levi” after Cpl. Chris Levi, a triple amputee Iraqi war veteran from Long Island, and the second was named “Volari”, the Italian word that translates as "flying." The 2 females were named by Mrs. Scanio’s 3rd grade class at the Unqua Elementary School in the Massapequa Long Island school district. The first female fledgling was named “Charlotte” after the student’s favorite character in “Charlotte’s Web, and the second was named “Faith,” to honor the fact that these children have faith in themselves that they can do anything. Hopefully these new fledgling will survive to mature, mate and reproduce, and the cycle of returning the numbers of falcons back to the wilds of New York City can continue. Falcons mate for life and generally return to the same nesting area. Every spring a web cam at 55 Water Street, in Lower Manhattan, follows the return of the falcons to their nest and watches as they hatch their eggs. The web cam is presently offline until next year, but when I learn of the return of the falcons in 2010 I'll blog about it then so that we'll all be able to watch the new cycle. It is called the Elevated Acre, described as "Lower Manhattan's backyard for special events where outdoor elegance meets downtown chic." Located 40 feet in the air, and surrounded by skyscrapers on three sides, the Elevated Acre is a beautiful and unique venue for a garden. ....and multiple little paths and alcoves with benches to sit on to rest and enjoy the peacefulness. At the top of the incline is a boardwalk, paralleling the East River, made of broad planks of Brazilian hardwood. From the boardwalk there are beautiful panoramic views of New York Harbor from the Brooklyn Bridge to Governors Island. Here you can see a good panoramic view of the East River and Brooklyn Heights. In this photo a Circle Line tour boat and a Water Taxi can be seen. Besides watching the active East River water traffic you can also watch the helicopters landing at the Downtown Manhattan Heliport located on Pier 6. The boardwalk leads up to a modern 50 foot LED lantern, called the Beacon of Progress, at the far corner of the plaza. At the other end of the acre is a seven-tiered concrete amphitheater forming an L around a large lawn blanketed in an artificial grass made by Field Turf which makes it a permanent green space. This space has table and chairs available for public picnicking use, and it can be rented for private parties and receptions, and has been used for free outdoor movie nights and concerts. But besides the views, the very best part of the Elevated Acre is that it is a quiet oasis full of beautifully maintained fauna and flora. It is truly an unexpected garden to find in Lower Manhattan, and because it is so secluded from the street, it is still relatively unknown, to even native New Yorkers. In my next blog post I'll show you another unexpected surprise on a building on Water Street in Manhattan. Mother nature abounds in unexpected places in New York City, and I hope you will come back to see some more examples. I am linking this post to Susan's blog A Southern Daydreamer "Outdoor Wednesday" theme event. Please visit Susan's blog today to see links to other blogs beautiful outdoor posts. 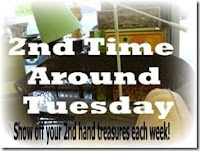 Thank you, Susan, for hosting this enjoyable event every week! The July Daring Bakers' challenge was hosted by Nicole at Sweet Tooth. She chose Chocolate Covered Marshmallow Cookies and Milan Cookies from pastry chef Gale Gand of the Food Network. We were given the options to make either, or both cookies. I chose to make the Milan cookies as my husband and I are big fans of Pepperidge Farm Milano brand cookies! I almost didn't complete this month's challenge as I don't have air conditioning in my kitchen, so when the weather is hot and humid I try to barbecue outside as much as possible. I saw everyone's completed challenges today, however, and I decided I couldn't resist baking at least one batch! The heat and humidity did give me a few problems, as my batter was very soupy at first since the butter had almost melted, and I had to add a little more flour to the batter and then chill it so it would allow me to pipe it onto my cookies sheets. The chocolate filling also stayed melted like water, probably because of the heat, and therefore was messy to work with. But the finished cookies were delicious, and my husband declared them "addictive," so I guess I'll save this recipe for repeat performances. Be sure to check some other Daring Bakers challenge results at the blogroll link here to see both of the July challenge cookies made to perfection! To learn more about The Daring Kitchen and to join in future Daring Bakers or Daring Cooks challenges please visit the wonderful website! 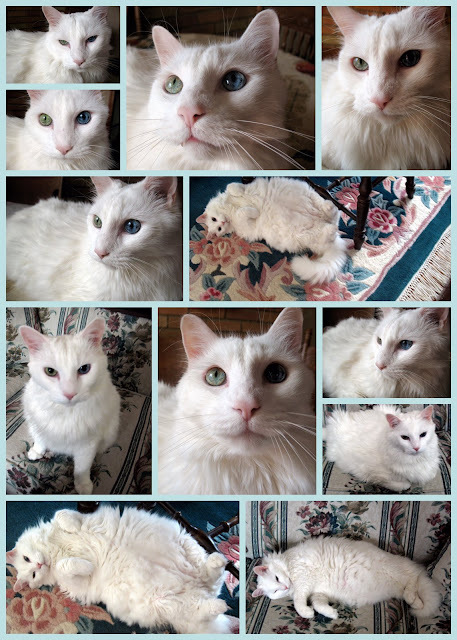 Mosaic Monday ~ My Cat Bo! I'm taking part in Mary of The Little Red House blog's "Mosaic Monday." Please check Mary's blog today for links to other blogs participating in this event. Thank you, Mary, for hosting this event and also teaching us how to make beautiful mosaics! I used the Google Picasa program to make my mosaic, using my photo files stored on Picasa. I like the program very much! I paid a nominal fee for extra storage, as I exceeded it's free usage, but I'm happy with the program's ease of storage, editing, and ability to mail whole albums to family and friends. My mosaic today is of my adopted cat "Bo." He is eleven years old and I've had him for five years, after adopting him from one of my daughter's friends who had developed an allergy issue. He's one of the sweetest and most lovable cats that I've ever had the pleasure of welcoming into my life. His breed is a RagaMuffin, which are classically large and heavy cats. "RagaMuffins are known for their stunning appearance and tender disposition. They are often likened to the soft loyalty of lapdogs. These cats appear to crave human attention and are often found in laps when their owners are otherwise distracted with television or books." That description fits Bo to a tee, as I can not sit in a chair without him jumping up to sit on my lap and purr. His next favorite position is to lay on his back next to me to have his tummy rubbed, and his third favorite position is curled up sleeping, which he does for quite a bit of the day because of his senior age. One of his unusual features is that he has one blue eye and one green eye, which you can see in some of the photos. His fur has to be brushed every day, and he does shed quite a bit, but those are minor chores in return for all the love he gives us. If you are looking for a mild mannered and loving cat to be your friend, a RagaMuffin is an excellent choice! A few times a year there is a promotion in New York City called "Restaurant Week" in which participating restaurants will offer special Prix-Fixe menus, usually $24.07 per person for a three course lunch and $35 per person for a three course dinner, not including beverages, tip or tax. It is a unique opportunity to experience some of New York City's finest restaurants for a fraction of the usual price. 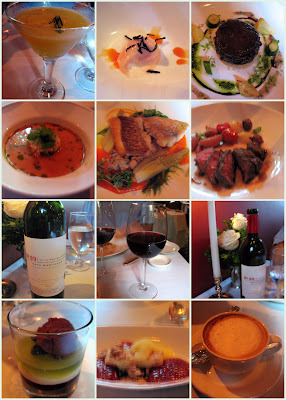 You can see my post about the restaurant we visited last year at this link. 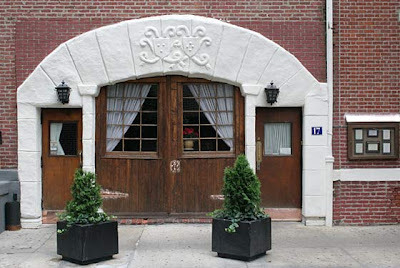 This year my husband and I decided to make reservations at a wonderfully romantic restaurant called "One If By Land, Two If By Sea," located at 17 Barrow Street, in the West Village neighborhood of New York City. The accepted lore is that it is located in an 18th-century carriage house originally owned by Aaron Burr, who served as Thomas Jefferson's vice president of the United States from 1801 to 1805, and is best known for killing Alexander Hamilton in a duel. It is a romantic hideaway, and the only indication that the building is a restaurant is the menu board on the exterior wall. 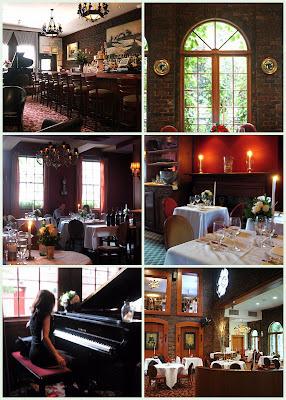 Inside, the restaurant offers plenty of atmosphere with exposed brick, gorgeous woodwork, multiple fireplaces, a pianist, a large ornate bar, and beautiful large palladium windows that look out on a garden. There are two rooms on the main floor and two upstairs. We sat in the Constitution room upstairs, which was very private and allowed for easy conversation. There were fresh roses on the table and long taper candles which were lit when we were seated. It was very comfortable and elegant. I ordered a signature rosemary passion fruit martini. It was delightful! We were given a luxurious amount of time to look at the wine list and menu. I liked the fact that throughout the meal we weren't rushed or interrupted, and I could see why this restaurant has such a romantic reputation because of that, besides the atmosphere. After ordering, we were offered an "amuse bouche" of an interesting combination of peach foam and seaweed flakes. A very sweet/salt taste which we enjoyed, although I imagine many might find the combination odd. I had the wild mushroom tart as an appetizer and my husband had the tomato gazpacho, which was flavored with crab, avocado and lemon basil oil. As an entree I had the pan seared red snapper, served with baby fennel and black eyed beans and red pepper essence, while my husband had the grilled bavette steak served with pearl onions, roasted radish and confit tomato. Both were excellent! We shared a Canadian red Merlot wine during our dinner. For dessert I had the blueberry composition which was an unbelievably delicious combination of rosemary gel, yuzi curd, blueberry tapioca, blueberry sorbet and a rosemary chip. My husband had the mascarpone cheesecake served with black current foam, black current streusel and pineapple granite. We ended with a cappuccino. It was a wonderful evening and a very memorable date night in one of our favorite neighborhoods of New York City! The summer NYC Restaurant Week Prixe Fixe runs from July 12–31 (excludes Saturdays), please check the web site to see a list of participating restaurants and any restrictions. I'll end this post with a little trivia. Does the name of the restaurant "One If By Land, Two If By Sea" sound familiar? It may be because you remember Henry Wadsworth Longfellow's poem called "Paul Revere's Ride" that is about the American Revolutionary hero by that name. My husband and I met in the Greenwich Village neighborhood yesterday to go on a date --more about that on a future blog post. We were a little early, so we decided to walk around a bit and enjoy this charming neighborhood when we spied an unusual brick wall across the street that had an open gate. What could this be? We walked across the street to see what it was and we saw this sign on the gate (all photos can be clicked on and they will enlarge) It was a beautiful garden of the Episcopal church Saint Luke In The Fields located at 487 Hudson Street. A flag stone path went right and left. There are four quadrants inside planted with a large variety of shrubs and perennial flowers along with some annuals. There are many benches to sit on and enjoy the cool shade and delightful views of the garden and all of its flowers, birds and butterflies. According to a brochure that I found near a garden shed there have been over 100 species of birds and 24 types of moths and butterflies sighted and recorded by garden volunteers. The garden's heat retaining brick walls create a microclimate allowing a wide variety of flora and fauna to thrive in this green space in the bustling city. An abundance of berries and flowers provides a small but important way station for migrating birds and butterflies during the spring and fall seasons. There are rare hybrids and native American flora in the garden. According to the brochure the first planting was in 1942 of a piece of the famous English Glastonbury Thorn. The Thorn survived until 1990, when it was blown over in a wind storm. It's progeny lives on in the north garden. We sat on a bench and observed this quiet peaceful scene, the only sound was the songs of the birds. If you enlarge the photo below you can see there were other people enjoying the garden, writing in their journals, reading a book, sketching. I'd love to return one day to do the same! This was one of a few different gardens surrounding the church, which are comprised of more than three acres of walks, lawns and gardens. Some of those areas are open only on weekends and contain cherry trees and 100 year old Silver Maples. The garden we found is open 10AM until dusk, except on holidays and special occasions. We entered the landmarked Saint Luke of the Fields church which was built in 1821. You can read about it's history on the church's web site on this link. I was enchanted to learn that One of the founding wardens was Clement Clarke Moore, a gentleman scholar of biblical Hebrew and Greek who also penned "Twas the night before Christmas," which was one of my favorite poems as a child. The austere interior was wonderfully maintained. I was saddened to learn that in 1981, a fire destroyed much of the interior of the church, the second such fire since the church's founding, and after four years of fundraising and rebuilding, St. Luke's was reconsecrated. A view of the back of the church and its organ. The windows were thick wavy glass that looked out at the gardens on one side and the Saint Luke's school on the other. The landmark sign that announces Saint Luke of The Fields as the third oldest existing church edifice in New York City. It was such a pleasure to find its beautiful garden that enabled us to enjoy a little respite before heading off to a special occasion, which I will be writing about soon. I hope you also enjoyed these photos and I hope to show you some more "Secret Gardens" I have discovered in New York City in future blog posts. I added this post to Susan of "A Southern Daydreamer" blog's "Outdoor Wednesday" group! Thank you, Susan, for hosting this wonderful event each week! Please visit Susan's blog today to view more links to other blogs participating in "Outdoor Wednesday." I'm joining Diane of "A Picture Is Worth a 1,000 Words" blog's "2nd Time Around Tuesday" carnival today. Thanks Diane! Seeing Judy's antique 1947 Monarch car in her blog post a few days ago reminded me that I recently took photos of two very cool antique cars that were for sale outside a used car dealer's lot in Brooklyn, New York on Crospy Avenue. These two beautiful vintage cars were literally stopping traffic outside Capri Auto Sales. Men were hopping out of their own cars to take a closer look. They certainly brought back some childhood memories to me. Isn't this salmon pink convertible gorgeous? It is a 1957 Ford Fairlane Skyliner Convertible. Thank you, Sally, for helping me identify it! A two toned green and white Chrysler New Yorker, complete with all the fancy chrome trim and large white wall tires that spoke of luxury in the day and age it was produced. I'm almost certain both cars were sold that day, or soon afterward, as they aren't listed in the used car store's inventory, and some lucky car collectors have added them to their fleet. What fun it must be to own and drive around in a beautiful "second time around" cars such as these! Billy Elliot on Broadway, NYC! Coney Island "Boom A Ring" Cicus!